Another short aquarium update (I noticed that the blog has been more about rock pooling recently than aquarium keeping, hence the change in blog header). I had very little time to do much with the tank and have not bothered with water changes or cleaning the mechanical filter. On the upside, there is little algal growth and creatures are generally happy (occasionally eating each other of course). Seaweeds have started to grow spontaneously, see for instance the Irish moss on the Turban topshell on the right of the picture below. On the downside, the aquarium does not look particularly nice overall (the reason I have not included a tankshot). It needs a lot more rocks. Also, the filtration is bad; although the water is very clear, there is quite a lot of debris. This issue is hard to fix, and sometimes I am toying with the idea of getting a larger tank with a sump (instead of dealing with the crappy Red Sea Max back compartment). I will get rid of the sea urchins, as I am not sure the molluscs appreciate getting stuck to them. 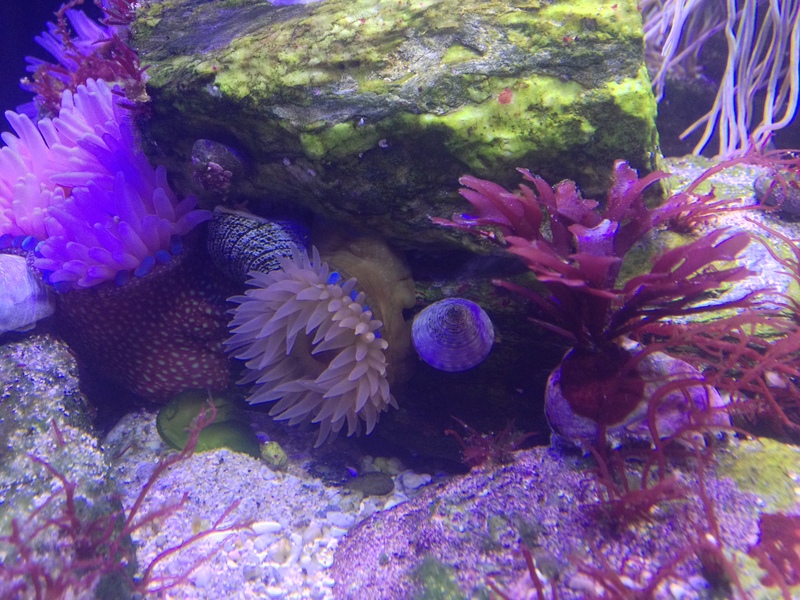 I have already gotten rid of the voracious snakelocks anemones and put them in a small tank (I will post about that soon). 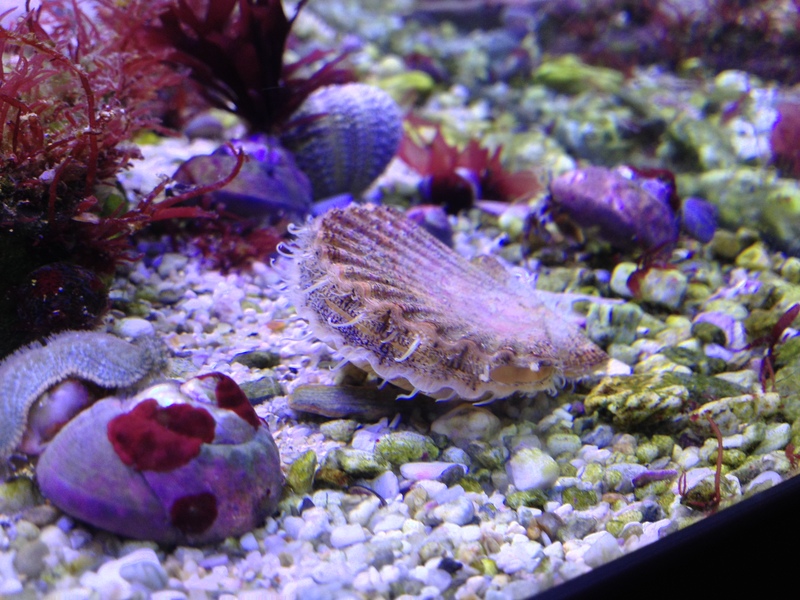 I have added a small scallop (Pecten maximus), which is very cool, and occasionally swims to another spot. I hope it will find enough to eat in the water. So the plan is to get a lot more rocks in. Perhaps I need a second Tunze circulation pump to get rid of debris. Without the snakelocks I can add more fish. Ideally I would like to keep Leopard-spotted gobies Thorogobius ephippiatus (see this old post) but they are extremely shy fish that live subtidally, so that would require a suitable trap and a lot of luck. I would also like more anemones (just like the very nice North American tanks on the Coldwater Marine Aquarium Owners Facebook group, see the links page). I have the impression that larger anemones have a better chance of surviving; perhaps in summer I can find some nice ones when diving. The Dahlia anemone has been eaten by Cushion stars and the smallest Strawberry anemony has been chased throug the tank by Painted top shells, Cushion stars and Snakelocks and now is half dead. So fish and anemones do not always go well together, the same is true for snails and anemones and (in the case of blennies and gobies at least) fish and snails… Before considering new inhabitants however I need to get the tank looking a bit nicer. This entry was tagged Leopard-spotted goby, Thorogobius ephihippiatus. Bookmark the permalink. My LEDs are a bit of a nightmare. They are divided into two strings, and one of em is not working for some reason. However, the second one is dimmed halfway, so I don’t really need it. The low light levels mean very little algae and some of the reds seem to like it too which is nice! I have seen RSM modifications with a sump in the cabinet but that is a bit too much effort for me…. It could be interesting to hear what your nitrate and phospate levels are. It its cool that you have new algae growing everywhere. And please post a full tank photo.